When it comes to folk songs, I like 'em bloody. You can keep your sensitive troubadours singing sweet pastoral melodies and hey nonny nonny. I like my folk songs full of senseless murder, greed, lust, betrayal and insanity. One of my favorite Steeleye Span songs is "Edwin," which comes from their album Now We Are Six. Not only is it a delightfully gruesome tale of young lovers vs. truly evil parents (Spoiler Alert: The truly evil parents win!) It also has a great guitar lick that I shamelessly appropriated for my own song, "Child of the Falling Star." Basically, it's the story of young Edwin, a sailor who went off to earn some gold, returning seven years later to his true love, Emma, whose family apparently runs some inn, basically a Bed-and-Breakfast of Doom. Edwin gets a room there, but that night as he sleeps, Emma's "cruel parents" sneak in his room, chop off his head, take his gold and dump his body in the sea to send him floating back to the Lowlands Low. Besides the music and the basic story of the song, Steeleye's "Edwin" has some lines that are simply unforgettable, starting with the very first one, "Come all ye wild young people and listen to my song ..."
Then there's "Young Edwin he sat drinking till time to go to bed/ He little thought a sword that night would part his body and head ..."
And then the not-so happy ending: "And Emma broken-hearted was to Bedlam forced to go / Her shrieks were for young Edwin that plowed the lowlands low. " But Steeleye, it turns out left out a few verses, including a key one, in which Emma tells Edwin to go stay at dad's inn for the night -- and not to tell him his true identity. She planned on meeting him there in the morning What could possibly go wrong? A version of "Edwin" appears as "Edwin in the Lowlands Low" in The Penguin Book of English Folk Songs, edited by Ralph Vaughan Williams and A.L.Lloyd in 1959. "This was an extremely widespread song in England, Scotland, Ireland and even more so in North America, where dozens of versions have been collected," the songs notes say. "... The song was also printed by everybody who was anybody in the broadside trade, but, on present evidence, only from the 1820s onwards. The plot would seem a natural for the melodrama stage or the cheap nineteenth century `shocker' novel ..."
That must be why I like it so much. I hadn't listened to "Edwin" in a few years. But a few nights ago, listening to an iTunes mix of old Lomax field-recordings, the song "Diver Boy" by a lady named Ollie Gilbert from Timbo, Arkansas popped up. Appearing on the collection Southern Journey Vol. 1: Voices from the American South, this was recorded in 1959. Young Emma is in this one, though the unfortunate "diver boy" is named Henry. Emma's brother, however, is named "Edward." It's the brother who helps his murderous dad here, while in Steeleye's songs it's Emma's parents. Natalie Merchant recorded a very similar version of "Diver Boy" on her 2003 album of (mostly) old folk songs The House Carpenter's Daughter. Neither tells what happens to the creepy dad and whoever helped him murder Emma's beau. For the dreadful deed that he had done he therefore did confess. For the murder of Young Edmund so dear who ploughed the lowlands low. 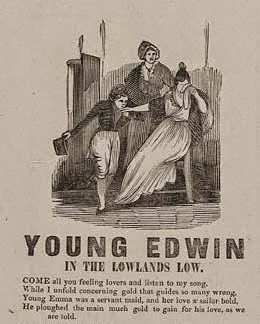 Read more about "Edwin," "Diver Boy" or whatever you want to call it at the excellent Murder Ballad Monday blog (on the website for the venerated Sing Out!, one of the greatest folk music publications) and at Mainly Norfolk, a "comprehensive overview of recorded traditional and contemporary English folk music". And what the heck. Here's a bonus throwback to an ancient time. WACKY WEDNESDAY: I Lost My Harmonica, Albert! 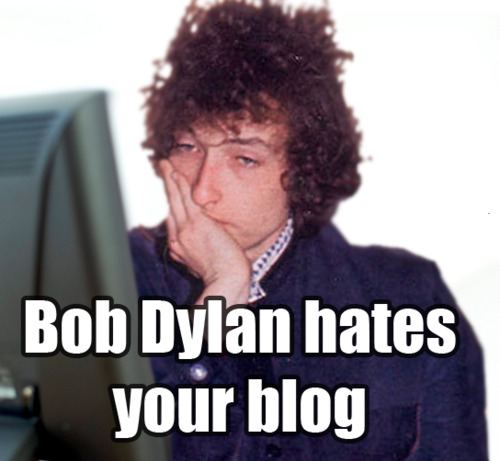 Here's a WACKY WEDNESDAY salute to some spokes-spoofs of a generation: Some of my favorite Bob Dylan parodies of all time. Was Simon & Garfunkel the first? Have some "A Simple Desultory Philippic (or How I Was Robert McNamara'd into Submission)"
And there's no video, but who can forget the night Bob rolled a 300 game? Emily Kaitz sure can't forget. Here's a great bunch of dames, Frances Carroll & The Coquettes. I stumbled across a shorter version of this 1940 Warner Brothers music short -- just the segment featuring "our charming little drummer" Viola Smith -- a couple of weeks ago when some fellow rock 'n' roll freak posted it on Facebook. From 1938 to 1941 Viola flourished in a highly acclaimed all female band that she and her sister Mildred organized, called The Coquettes. The Coquettes were so successful, and she as their drummer so popular, that Viola and her drum set graced the cover of Billboard Magazine on 24 February 1940. So just sit back and enjoy some hot swing from this remarkable band. And here's an interview with Viola Smith from a couple of years ago. She's still alive and 102 years old. Those familiar with the music of Stan Ridgway know that despite this singer's natural talent, the real secret of his success is a talent scout and big wheel by the name of Jackie "Teak" Lazar. Not only is Jackie the brains behind Ridgway's career, at least since Ridgway's departure from Wall of Voodoo, he's also had roles in Ridgway videos and, yes even at least one guest vocal on a Ridgway album. Back in 2002, Jackie appeared on a hidden track on Ridgway's album Holiday in Dirt. It was a sensitive rendering of Charlie Rich's greatest hit, "Behind Closed Doors." Some purists argued that the track should remain hidden, but I beg to differ. In fact I bet you'll agree that no one knows what goes on behind closed doors with Jackie. And Jackie starred in Ridgway's 1995 video of "Big Dumb Town." Some say that Jackie is a distant cousin of Jimmy the Talking Dummy, who used to be part of the road crew for Dan Hicks and the Hot Licks. 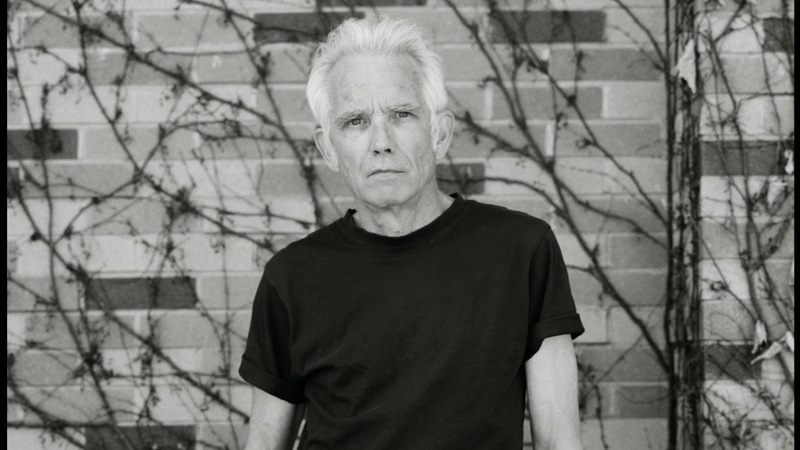 Though Jackie "Teak" Lazar recordings are rare, you can still find him singing some American classics on MP3s ((that I think originally were posted on Ridgway's website many years ago.) Three of them -- "Always on My Mind," "A Very Good Year" and "The Wayward Wind" are HERE. Just don't believe the hideous lies and slander in the very last line in small print at the bottom of the page. 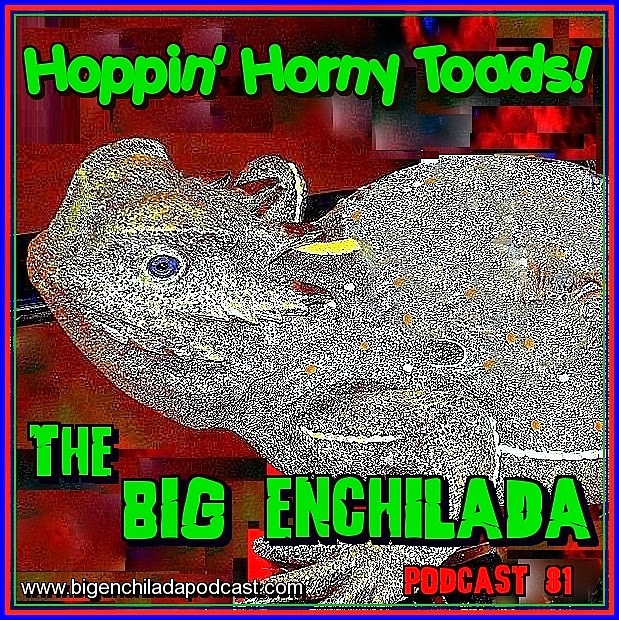 Hoppin' Horny Toads! It's the New Big Enchilada Podcast! Hoppin' Horny Toads! This Big Enchilada episode is bringing you some fine hillbilly sounds old and new -- honky-tonk, rockabilly, bluegrass, roadhouse boogie, cowboy songs and barroom weepers -- by a dangerous array of artists old and new. 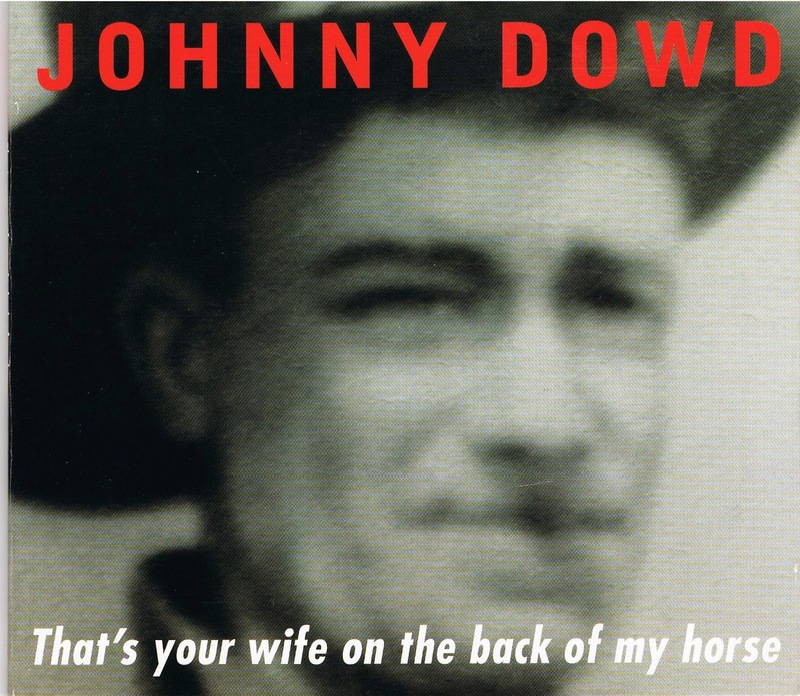 Johnny Dowd writes his songs like a sniper aims his gun. Sometimes his songs are like a captured serial killer’s confession. They’re full of regret, shame, venom, horrifying humor, and uncomfortable truths. Dowd himself has compared the record to his first one, Wrong Side of Memphis. That late-1990s album is also mostly just Dowd on a variety of instruments. But it is more acoustic and rootsy, based in country and blues. On this new one, the music behind the lyrics is crazier than ever: low-tech electronica; rasty, distorted guitar licks; insane beats from an ancient drum machine over Dowd’s growling drawl and Coogan’s angelic melodies. It’s “New Year’s Eve in the nuthouse,” as Archie Bunker would say. And that's just one of Dowd’s characters who seem like a coiled snake about to strike. On “Nasty Mouth,” Dowd’s narrator spews harsh judgment about a woman, who, I would guess, rejected him. “I’m just trying to forget the words that came out of your nasty mouth,” he spits over ambient blips and bleeps and a dangerous fuzz guitar. Left the building? Well, maybe. But I bet he actually just went to the dark alley behind the building. * Giving My Bones to the Western Lands by Slackeye Slim. 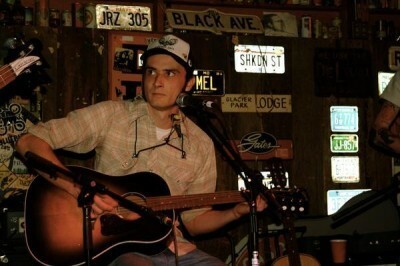 Joe Frankland is another singer-songwriter who likes to explore the shadows, though his music is rooted in the country, folk, and spaghetti-western realms. Under the name Slackeye Slim, Frankland’s songs frequently are cast in an Old West setting, though his themes of sin, redemption, loneliness, desperation, and freedom are universal. Don Houston and El Santo Grial’s antihero, Drake Savage, would have a lot to talk about. Assuming they didn’t kill each other first. But not every song on the new Slackeye album deals with crazy violence. One recurring theme here is psychological healing. You can listen to and/or name your own buying price for Giving My Bones to the Western Lands at www.slackeyeslim.bandcamp.com. But even though you can snag it for free, pay him something. Don’t be a jerk! Readers who watched the opening scene of the premier episode of Better Call Saul will know what I'm talking about. 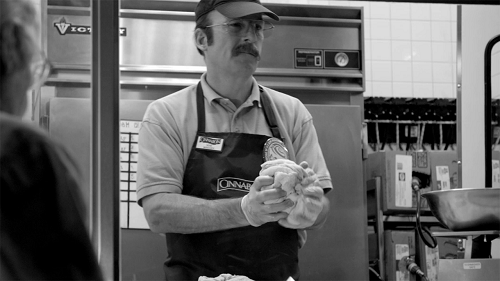 It's a black-and-white scene featuring a mustachioed Saul Goodman working at a Cinnabon shop at some Omaha mall, apparently hiding out from his recent life of sleazy lawyering and drug money laundering in Albuquerque, as depicted in Breaking Bad. The Ink Spots played a large role in pioneering the black vocal group-harmony genre, helping to pave the way for the doo wop explosion of the '50s. The quavering high tenor of Bill Kenny presaged hundreds of street-corner leads to come, and the sweet harmonies of Charlie Fuqua, Deek Watson, and bass Hoppy Jones (who died in 1944) backed him flawlessly. All Music notes that "Countless groups masquerading as The Ink Spots have thrived across the nation since the '50s." I can vouch for that. Back in the early '80s I was assigned to interview the lead singer of "The Ink Spots" who were playing in Santa Fe. I talked with some old guy in his hotel room at La Fonda. I forgot his name, but it wasn't Bill, Charlie, Deek or Hoppy. Part of the problem was due to the original members themselves. Both Charlie and Deek started rival Ink Spots groups in the early '50s. Be that as it may, The (real) Ink Spots made some sweet sounds during their glory years of the late '30s through the mid '40s. 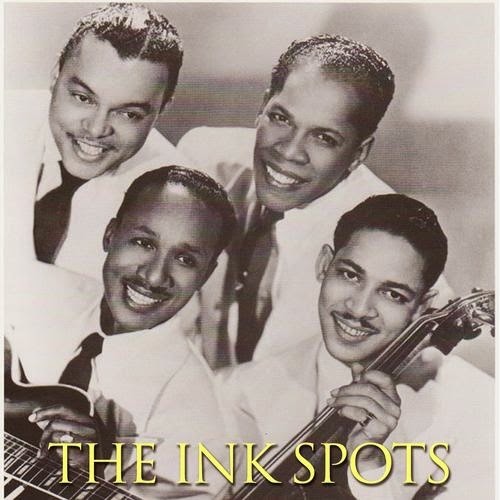 And speaking of songs on recent television shows, The Ink Spots covered this Vera Lynn hit, which graced the end of The Colbert Report in December. The group recorded the song at least three times between 1941 and 1944. Next Monday is Presidents Day. Because I don't do "Wacky Monday" on this blog, we'll just have to celebrate a little early. Until recently I thought Presidents Day was in honor of George Washington and Abe Lincoln, both of whom were born in February. But that's not true according to the Snopes website -- which apparently took time off from debunking 9-11 conspiracies and knocking down rumors that a little known section of Obamacare involves selling the kidneys of little white girls to Kenyan organ smugglers. According to Snopes, the only official holiday next week is for Washington's Birthday. 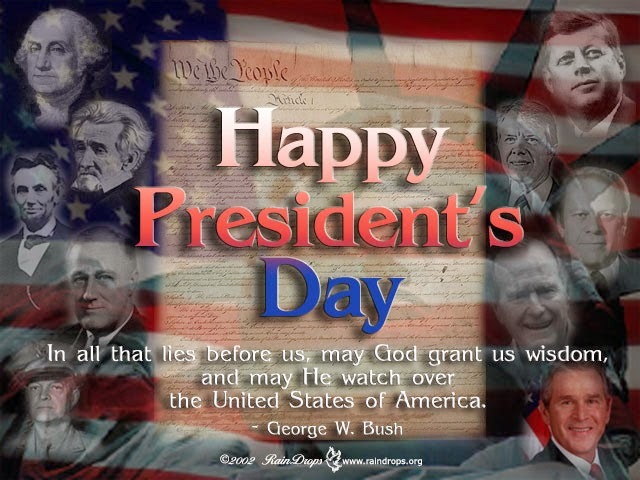 Technically "Presidents Day" doesn't exist. Congress never passed a law to declare it as such. But what the heck. Why not honor, or at least lampoon, as many presidents as possible in preparation for this holiday that isn't even a holiday. Here are a few songs to set the tone. First a snazzy little musical history lesson from They Might Be Giants. The next artist, known as "Mr. Beat" on Youtube, seems to have been very influenced by They Might Be Giants. Here's a song about the guy who was president when I was born. Country Joe & The Fish give a one-fingered salute to two presidents with this one. The original version of "Superbird," which appeared on their first album Electric Music for the Mind and Body was only about LBJ. But sometime after Richard Nixon took office, Country Joe updated the tune. This next tune is a "song-poem" about our disco-era president Jimmy Carter. It was written by Waskey Elwood Walls Jr. sung by song-poem titan Gene Marshall (Gene Merlino). 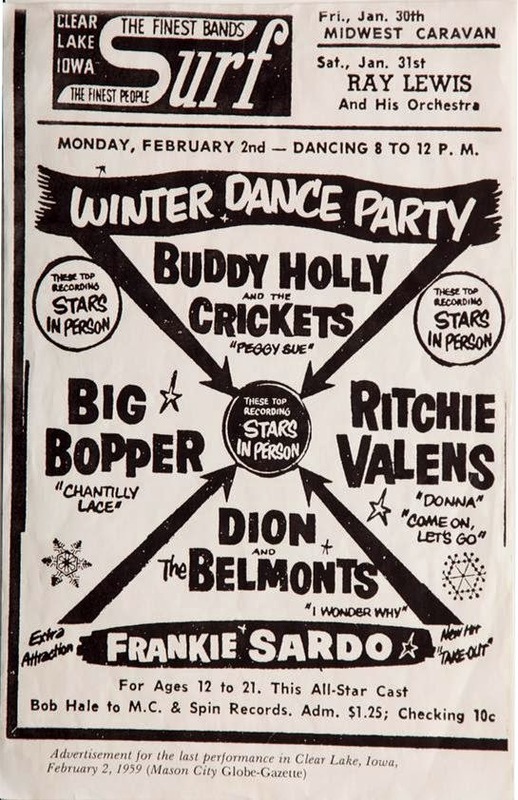 I know I usually throwback to the pre-rock 'n' roll era on Throwback Thursday, but the plane crash that killed Buddy Holly, Ritchie Valens and The Big Bopper -- 56 years and two days ago -- is a big one. I was only five years old when the single engine plane carrying the three rockers went down in a snow storm over Iowa on Feb. 3, 1959. But I was a little rock 'n' roll freak even then. I loved The Coasters and I loved Buddy Holly, especially his hit "Peggy Sue." I recall hearing it played on American Bandstand. My mom told me that one of the teenage girls dancing on the show was actually Peggy Sue. I was only five, but I was in lust! If my memory serves, I found out about the plane crash listening to a disc jockey talk about it on the radio before playing a Buddy song. I only remember feeling incredibly sad. I'd never thought much about death before. How could someone as cool as Buddy Holly die? I still get sad thinking about it. At least the music lives on. And here's the Bopper, J.P. Richardson, the only one of the three who hasn't had a movie made about him. And what the hell, this is far more recent history, but Feb. 4, 2009 is the day that Erick Lee Purkhiser, aka Lux Interior of The Cramps, died. February is just a crappy month for rock 'n' roll. One of the many contributions of Dr. Demento is his rescuing a comic singer called Benny Bell from the dustbin of history. 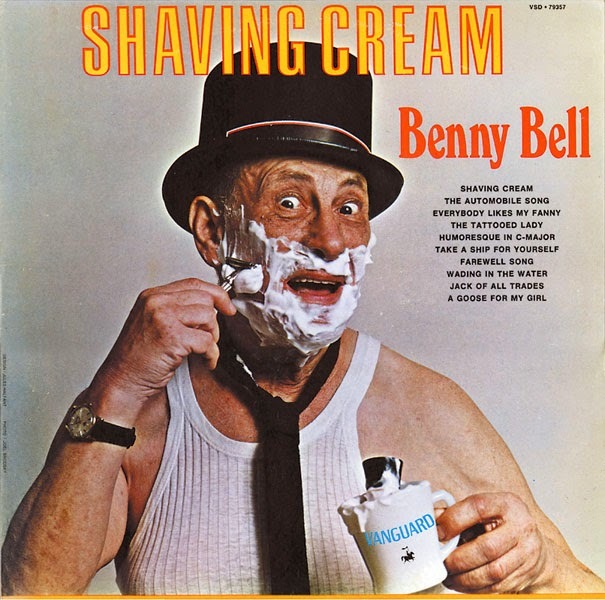 Thanks to the good doctor, who frequently played "Shaving Cream," recorded in 1946, and to a lesser extent oter songs like "Everybody Loves My Fanny," Benny Bell won a whole new generation of fans. Bell, born Benjamin Zamburg in 1906, (and died in 1999) was a pioneer in Jewish American comedy records. Like so many others of his day who lived on Manhattan’s Lower East Side, Benny Bell’s first language was Yiddish. He was drawn to the world of entertainment from an early age, already writing song lyrics and music as a teenager. The lure of show business beckoned and before long he was performing on the Vaudeville stage as Benny Bimbo. A natural comedian, Benny Bell enjoyed nothing more than making people laugh. Starting his own record company in the 1930’s, he became a pioneer in the field of Yiddish comedy phonograph recordings. He produced a series of party records using different names, e.g. Paul Wynn, and which were considered risqué at the time, but are really quite mild by today’s standards. The Internet Archive has collected 31 old Benny Bell recordings. Most are from old scratchy 78s in the '40s, though some like "A Goose for My Girl," "Farewell Song" and "Turtle Song," as late as the '70s. Download any or all of these HERE or listen below.